Throughout New York City, one sees a variety of "grades" posted in windows of all kinds of restaurants and coffee shops; any place that serves food. There are three grades, well four actually: A (the best), B (not bad apparently) and C (well, it isn't as bad as it sounds). The fourth rating is "Grade Pending" which can be taken several ways. The idea is that the greatest city on earth should have the best restaurants on earth... and maybe... they should have some sort of hygiene standard, a regulated "official" kind of standard. Enter the NYC Health Department which promises to visit, and pass judgement, on every coffee shop, food cart, bagel shop and restaurant in the five boroughs of New York City, and do it every year. Most of the food carts are Halal and serve the same hot dogs and pretzels throughout the city, so that's easy enough. Boring comes to mind. Vancouver's food cart business is extraordinarily different from what we saw in NYC. Most establishments show the posters in their windows and most of the signs we saw were A or B. In our travels we didn't come across any establishment boasting about a C. The designation made a difference to us though I'm not sure why. Our favourite coffee shop was rated A, yet cited for some minor infractions, including providing possible entry to vermin. Lupa, the popular restaurant in SoHo where Justin Timberlake's doppelganger works, was given an A, though the unisex washrooms (common in Manhattan) were slightly off-putting. A wonderful find for us was actually rated "Grade Pending." J.G. 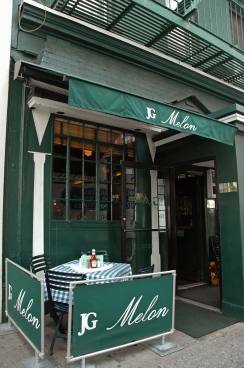 Melon on 74th Street and 3rd Avenue on the Upper East Side has been around since 1972. One would think they would have a handle on the New York City Health Department by now, but no, the hygiene rating is "Grade Pending." J.G. Melon doesn't have a website. They don't take cards. They don't have a cash register or any POS terminals. One lone video screen hangs from the ceiling and it doesn't seem to have any volume. Classic hits from the 70s and 80s can be heard, but only just, making conversation with a neighbour possible and enjoyable, and New Yorkers delight in the adventure of conversation, as did we.We talked with other patrons and with Neil of course. Neil was our bartender and he poured generously, as would I if cash were the only denomination of choice. Sherry asked for sparkling wine and Neil said "No sparkling wine here. Just champagne." Well. I'm not sure if Neil and I have the same understanding of the actual definition of champagne, though it didn't really matter. Jeem, of course, was continuing his quest to try a variety of bourbons and Neil was helpful and generous in that regard. The place seems a throwback to another time. I don't know if it is the 1970s or something trying to be the 1970s, but time seems to have stopped around 1973 in this Upper East Side institution. It was a weird and wonderful place in which to find ourselves after a rainy afternoon in Central Park, regardless of the Health Department grading. J.G. Melon provided the background for a scene with Meryl Streep and Dustin Hoffman in the 1979 film Kramer vs. Kramer. 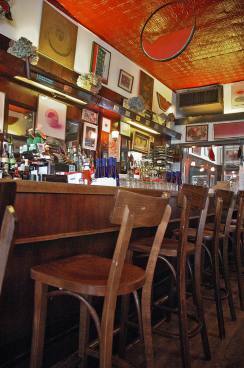 The former mayor of New York, Michael Bloomberg, said the burgers here are the best in the world. On Urban Spoon it has a rating of 86%. On Trip Advisor it gets 4 of 5 stars. And its decor, apart from a kitschy and post-Nixon time frame, devotes most of its wall space to pictures of watermelons. What does that tell us I wonder? Though Jeem was tempted, especially after seeing a few go by, he passed on the burgers. After all the hygiene grade is still pending. However. The drinks, the people and the substance of the place are first rate all the way. This is a place... to come back to one day. Soon. I hope Neil is still here. You can see all NYC restaurants and their ratings here on the NYC Health Department restaurant ratings map from the New York Times, interactive and updated regularly.